REDUCED PRICE 1`650,000.00 Casa Coapinole is located to the north of Pitillal, by the main Ecuador Street, this house has a great Potential market, as is located in commercial zone, and also a big area to build a couple of apartments. just 30 minutes from the down town, and 20 minutes from the Airport. Villa Rome offer classic décor, has two levels, with 2 bedrooms, air conditioning, Living area, cable tv and a terrace with garden views. The kitchen is equipped with coffee maker, fridge, microwave and dining area, while the bathrooms come with shower. 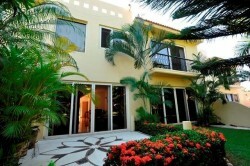 Nice Contemporary house, in the very exclusive Residential Area of Nuevo Vallarta "Casa Mansur". Just 5 minutes away from the pristine beach of Nuevo Vallarta. Contemporary Hacienda style finishes, Mexican style architecture design home. Charming family, home, just 5 minutes form new Macroplaza mall & Premier Hospital, schools, park, shopping and restaurants. 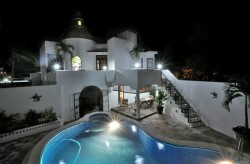 Two floors house with 4 bedrooms and 4.5 bathrooms, swimming pool, Jacuzzi and beautiful gardens. GREAT OPPORTUNITY!!! Beatiful and elegant golf course home in the upscale residential neighborhood of Marina Vallarta, exclusive Quinta Esmeralda complex. Close proximity to schools, Marina mall and restaurants make this a prime location.